President Reuven Rivlin welcomes Paraguayan counterpart making the first state visit by a president of Paraguay to Israel. 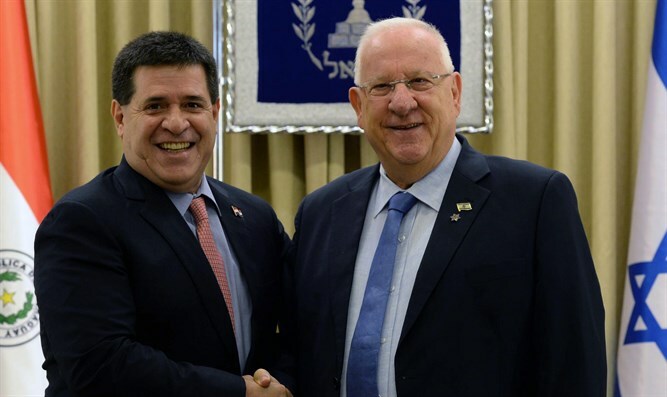 President Reuven Rivlin on Monday hosted at his residence an official welcome ceremony for the President of Paraguay, Horacio Manuel Cartes Jara, making the first state visit by a president of Paraguay to Israel. Rivlin welcomed his guest on the red carpet as the two Presidents stood for the national anthems, reviewed a guard of honor, before going on to deliver brief public statements. “We are pleased to see the strengthening of ties between our countries, and I hope that your visit here will serve to further deepen these good relations,” he added. “I hope that beyond the official meetings you have scheduled you will have a chance to visit Jerusalem, the city holy to three faiths, and tour the land of Israel, the land of the Bible. Here, one can touch history,” he concluded. President Cartes thanked Rivlin for his warm welcome and said, "This is an emotional and historic visit for all of us, and we are excited and delighted to visit Israel, a friend of Paraguay. My visit is an opportunity to strengthen the ties between us which go back to the birth of Israel, yet are no less thanks to the values we share." "Israel stands out in its ability in agriculture and agri-tech, and we are interested in working to share knowledge and technologies which will contribute to the development of our country and its young population. We often look too much at trade statistics and figures and not enough at our shared values. We are a state which voted for the establishment of Israel in 1947, but we are much more than that. In truth it is not such good news that this is only the first visit of a Paraguayan president to Israel, something which makes my visit of even greater importance," he added. Following their statements, the two Presidents went on to hold a working meeting during which they discussed the strengthening of bilateral ties between the two countries. The Israeli Embassy in Asunción, Paraguay, was reopened in August of 2015. The Israeli Foreign Ministry noted prominently that the government of Paraguay stood by Israel during Operation Protective Edge in the summer of 2014, even when Israel was criticized by many countries, and has been supportive of Israel at major international forums. Israel cooperates with Paraguay in the battle against terrorism and maintains a supportive role in actions against Hezbollah at the tri-border region.